1995 was a landmark year for BT Phonecards, as ever since their launch in 1981 the cards had been produced by Landis & Gyr and had used optical card technology, this though was about to change forever. 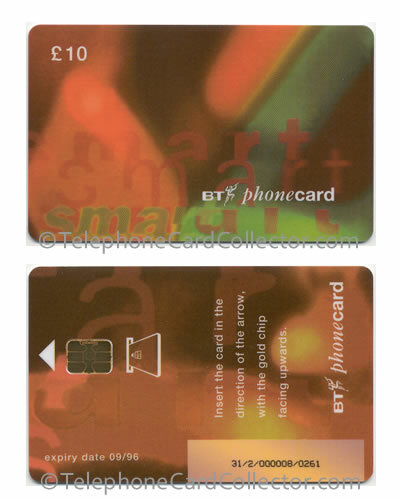 Following the successful, but limited in scale, Alpha Trials in East Grinstead, Liverpool and Southampton of a new chip card, it was time to make the new chip cards named BT 'Smart Cards' available on a much larger scale than the Alpha Trials. 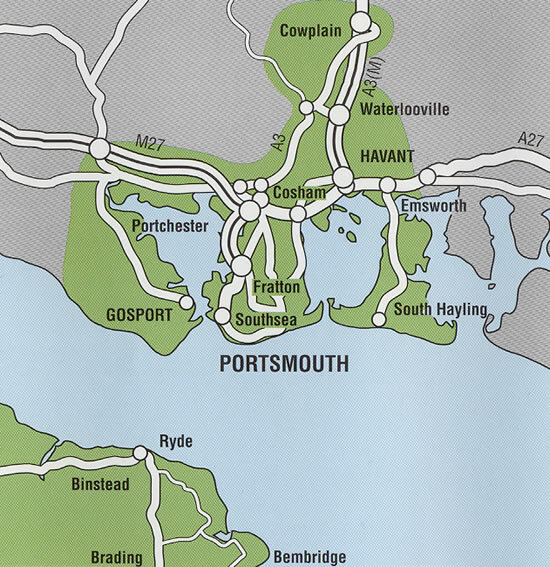 Designated 'Beta Trials' the Portsmouth telephone area and the Isle of Wight were chosen for this purpose. All payphones in the area were changed, and retailers were supplied with the new cards. Initially cards were available with 20% discount to encourage users. Pictured right - BT Smartcard Presentation pack featuring four of the new smart cards. 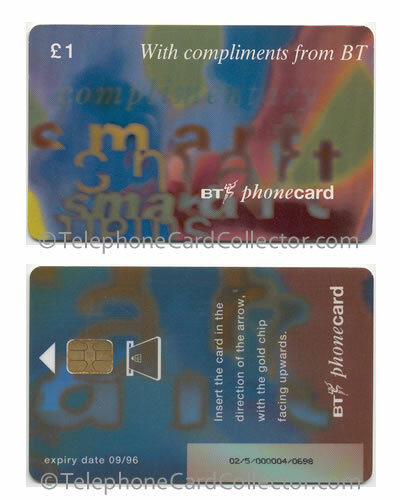 These packs were given away by British Telecom to Phonecard stockists/retailers in the Solent trial area and also sold to telephone card collectors via BT's Phonecard Collector's Club - BT Phonecard Direct. I'm sure Tuesday 23rd May 1995, will go down in Phonecard history, as this was the release date of the new Smart BT Phonecards. The Isle of Wight and Portsmouth area has been chosen and the first area to try out these chip cards. 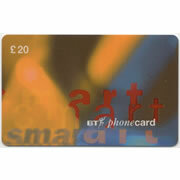 New payphones have been installed in the area, and stockists of phonecards now sell the new style telephone cards. 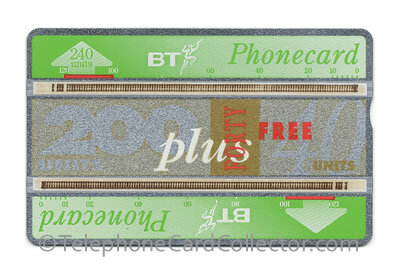 All of the new style micro chipped smart BT Phonecards, unlike with the older optical BT Phonecards had an expiry date. The expiry date on the first cards released in May 1995, had an expiry of September 1996. 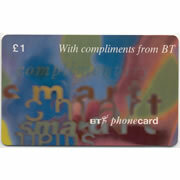 All of the different BT Beta Trial Cards and their catalogue numbers e.g. TRL021 are shown below. 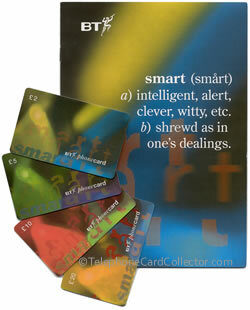 To view a larger image and to see both sides of any particular card, simply click the picture of a card below. The following article is taken from the Isle of Wight County Press, dated Friday 19th May 1995. 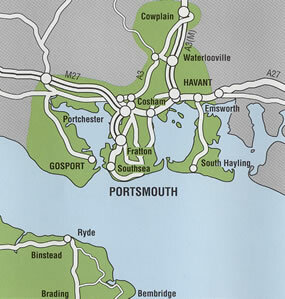 The map pictured below shows the full Solent trial area for the new BT smart Phonecard. 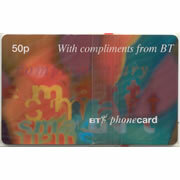 BT has chosen the island as a launch area for a new state-of-the-art phonecard which is available from Tuesday. 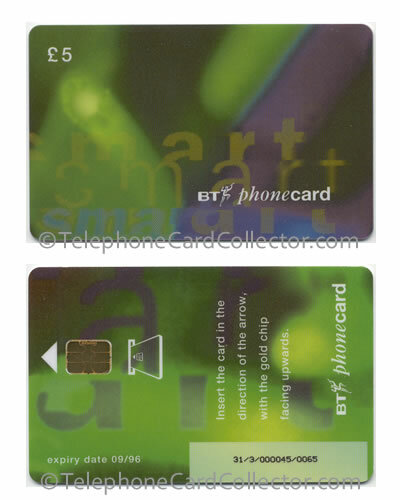 The new card will contain a microchip memory enabling it to store a range of information, such as phone numbers. The Isle of Wight and Portsmouth are the first areas in the country to benefit from the new smart card, which will be introduced nationwide at the beginning of next year. To accommodate the card, BT is updating 110 of the island's 210 payphones. Eight-four will be multi-payment, accepting the new card, cash, credit cards and the BT Chargecard, whie the remaining 26 will be cardphones accepting the new smart card only. A BT spokesman said the island and Portsmouth were chosen as the launch area because their combination of town and country offered a perfect mix of customers. Mr Bob Warner, director of BT Payphones, said the new microchip technology would be key to offering advanced services from its payphones in future. "It might enable our customers to use phonecards in other countries, store personal phone numbers or collect points for rewards as an incentive for shopping at selected retailers." he said. "Smart phonecard technology is extremely reliable and will improve the quantity of service to customers." The new cards, which go on sale from Tuesday, come in denominations of £2, £5, £10 and £20, which special introductory offers of 20 percent discount lasting about two months. Mr Warner said, "By having a mixture of payphones available, people will be able to use up their old cards and try out the new ones." A leaflet with maps showing locations of the new phones will be delivered to homes from Tuesday and will be available from local BT Phonecard stockists. Leading a 16-strong team of engineers installing the new phones is Mr Alistair Laidler, 40, of Northwood, who is relief BT payphone manager for the Isle of Wight and Portsmouth. "The latest new payphones really are the very latest technology - and the island has got them first" he said. Mr Barry Groves of Yarverland, Smart Phonecard implementation manager, has been living and breathing the project for the last seven months. "People will find they have lots more choice in how they pay for a call. The number public payphones that accept cards is increasing, but not at the expense of those that take cash", he said. You may have noticed recently that BT Payphones in the Portsmouth and Isle of Wight area have been changing. What they're changing to are state-of-the-art payphones that'll accept the brand new smart BT Phonecard. 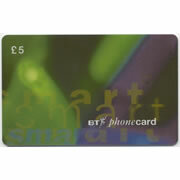 As a BT customer, you'll be amongst the first to take advantage of this exciting new development (we plan to go national with the new smart BT Phonecard in the first half of 1996). What's more, you can save up to £4 when you buy one. Although the number of conventional cardphones in the Portsmouth and Isle of Wight area will be reduced, this will be more than made up for by the new payphones replacing them. So in fact you'll have access to a larger number of BT Payphones taking cards than you did before. 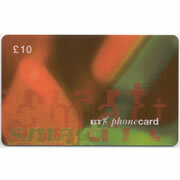 And you'll still be able to use cash, credit cards and BT Chargecards plus, of course, our new smart BT Phonecard. It may be smart but is it easy to use? It couldn't be easier. 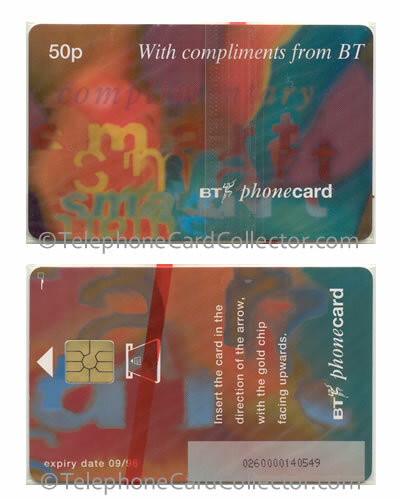 The only difference between the new smart BT Phonecard and the old is that you "post" it longways instead of sideways (you'll find instructions on the back of every card - see right - as well as beside every one of our new BT Payphones). What about my old Phonecard? No problem. There'll still plenty of BT Payphones that'll take your existing BT Phonecards and will continue to do so for at least another year. So, although you'll no longer be able to buy the old Phonecards in the Portsmouth and Isle of Wight area, you needn't rush to use up any remaining units.